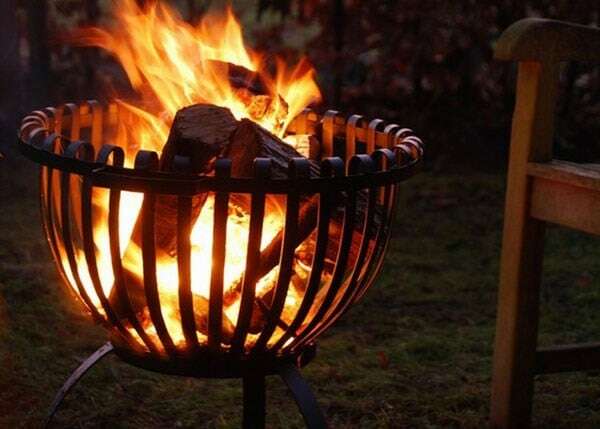 Buy Steel fire basket: This simple, elegant fire basket is designed to be used outdoors. It will take several burning logs. The open sides allow the heat to radiate out, keeping everyone huddled around it warm. We also offer a round tray for it to sit on (sold separately) to protect the standing surface.<br><br>Although the steel is finished to a high standard with a powder coat, over time it will show some signs of rust if left outside. The black paint will naturally burn off with use.<br><br>Measurements:<br>Ø50cm x H55.5cm (base Ø40cm)<br><br><b>Warning:</b><br> For outdoor use only. Keep children and pets away from the brazier when lit. Always position away from buildings on a safe non-flammable surface. If using on a paved patio, place on an additional protective paving stone made from solid natural stone or concrete at least 5cm thick. This will avoid possible discolouration and cracking of your patio, as some mock slabs made from resin or ceramic may be susceptible to heat damage. Only for use with logs or charcoal. This simple, elegant fire basket is designed to be used outdoors. It will take several burning logs. The open sides allow the heat to radiate out, keeping everyone huddled around it warm. We also offer a round tray for it to sit on (sold separately) to protect the standing surface. Although the steel is finished to a high standard with a powder coat, over time it will show some signs of rust if left outside. The black paint will naturally burn off with use.